The back of the heart has another love heart relief-stamped into it. The Love Hearts come in a number of colors – white, pink, green, yellow, orange, purple – but to my palate they all taste exactly the same. At first taste they have a slight fizziness to them, and similar to their American counterparts are quite chalky in texture. Once you chomp through one you get a nice tangy fizzle on the tongue, and because they are so thin they’re easy to eat. Amazingly, these candies are popular enough to warrant an entire online store, which includes things like Love Hearts inspired photo frames, teddy bears and yes, even a line of Love Hearts jewelery! They can personalize the packaging (although not the hearts themselves) and the site says they will take Valentine orders until the 13th, at noon. Better still, they have a currency converter so people outside of the UK can order from them as well. Yummier than conversation hearts, with an equal amount of dorkiness (hey, why don’t you… “Page Me” sometime?) and with an added European coolness-factor, these were a winner with me. There’s still time – why not “Trust Me” on this one and order some for your sweetheart? Canadians have conversation hearts too. but they’re really gross. bleh. I agree with both of you. I have been looking for them for years. I LOVE THEM. 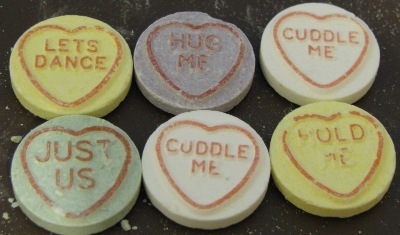 As for finding them google love hearts candy and you should be able to find them there.